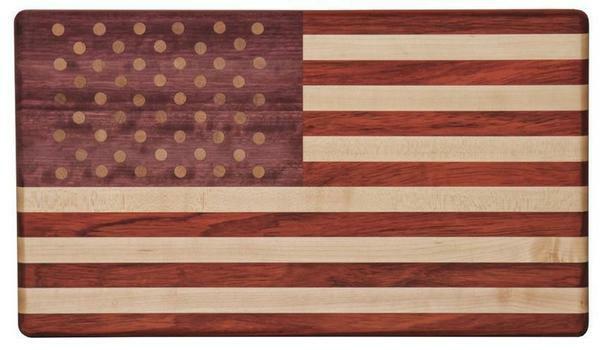 True hardwood beauty meets everyday practicality in this exotic wood cutting board, crafted to resemble the American flag! This cutting board is not dyed - the colors are a natural part of the exotic woods' beauty. Hard Maple wood creates the "white" stripes that are alternated with those of reddish Padauk wood, while Purpleheart wood brings blueish tones to the famous red, white, and blue. This board both celebrates the States in design and construction. Though made with two exotic woods, it is handcrafted in Northern Indiana by an Amish woodworker. Imagine it in your space, doubling as a mealtime helper and kitchen decor. Or delight a loved one with this unique gift! Perfect for new homeowners, your favorite grillmaster on the Fourth of July, or the special chef in your life. Purpleheart wood is a hard tropical wood, perfect for use in a cutting board. Though found in hot and humid climates, it is comparable to North America's oak species. Padauk is a tropical hardwood, native to both African and Asian continents. Its natural home is in rainforests along the equator. Padauk's color is bright orange to crimson at harvest, gradually oxidizing to purple-brown tones. Hard Maple is an excellent addition to these two woods as it is a regular wood of choice for single-wood cutting boards. Call us with any questions about this board or exotic woods! 18" x 10.25" x 1"
Maple Dowel Rods as Flag "Stars"